44 delegations were present when UNESCO Constitution was adopted. 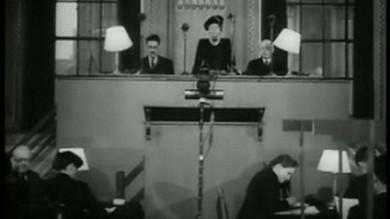 This footage shows Ms Ellen Wilkinson, President of the conference, as well as British Minister of Education, while she reads aloud the preamble to UNESCO's Constitution. This video is also part of the documentary "Building Peace in the Minds of Men"
Authors and personalities: Ellen Wilkinson, speaker. Production: United Kingdom. Central Office of Information, producer.